This location offers magnificent views towards Snowdonia. 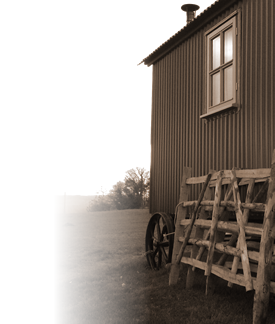 The Shepherds Huts are the bedrooms and the Stable and Barn is your daytime accommodation. 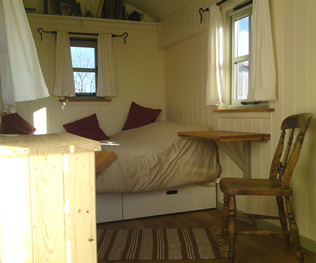 The shepherds hut with a door on the side sleeps 4 with a bunk bed at one end and a double bed at the other. 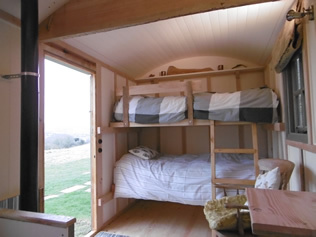 The ‘pointed’ roof hut has a double bed and sleeps 2. 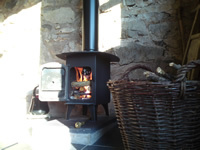 Both have woodburning stoves and electrics (lights and sockets). 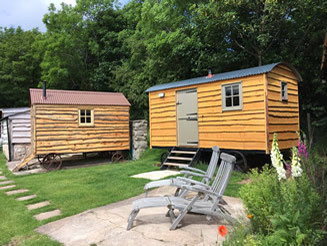 You can book either hut or both for larger parties. A renovated Stable close by to the hut has all the facilities that you will need during your stay and is for your exclusive use. 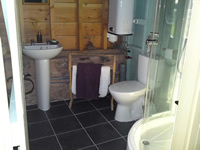 It has a heated shower room with toilet, washbasin, wood burning stove with a large top plate which you can use for cooking or heating food, large sofa, kitchen area with fridge, kettle, cutlery, utensils etc. The fridge is stocked with fresh milk, water, butter, cheese and locally produced yoghurts. 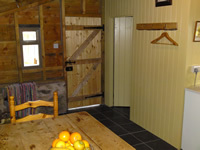 A door leads from the Stable into a Barn which has an open area for you to sit and enjoy the views or if you are feeling energetic there is a dart board to hand.